Anderson Spur. Have you ever wondered why the trail out of Happy Isles crosses the river to go up the north bank, even though that side is rockier than the other side, and then climbs too high before it goes back down again to the Vernal Falls Bridge? Well, the John Muir Trail didn't go that way originally. (It was Mr. Snow's Trail then.) That original trail is now the horse trail, which so many hikers have stumbled down after taking a wrong turn at dusk. But there is nothing wrong with the route of the horse trail, especially now that horses are much less common on the trail than they used to be. Certainly not wrong enough to warrant building a new trail and a much bigger bridge than would have been needed at Illiouette Creek to improve the old trail. The answer goes back to the Mist Trail and the Anderson Trail, and a race to get an easy and safe trail both to the top of Vernal Falls and to Snows Hotel which was built on a large flat spot on the north bank, just above the Silver Apron and below Nevada Falls. Remember, in those days most of the trails were built as toll trails, to generate profits. The Mist Trail was built about the time of Snow's Trail, which circles far above Vernal Falls before coming back down to it. But to get up Vernal Falls, the Mist Trail had a long, damp and mossy wooden ladder. At least one person fell off it and died. The attachment bolts for this ladder are still accessible on top of the outcrop. Much later, someone blasted rock so as to turn a small crack into the current ledge with railing that climbs next to the falls. 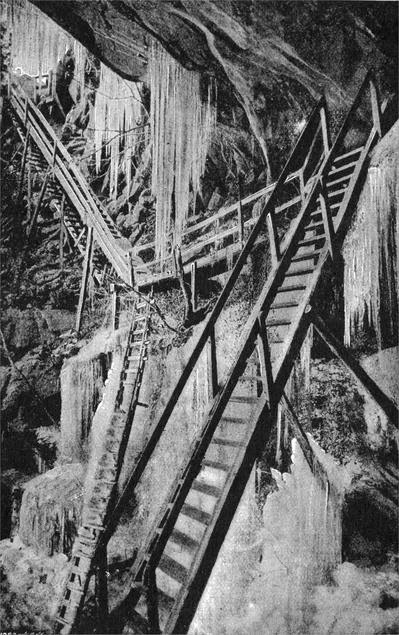 But at the time Anderson set out to build a competing trail, the Mist Trail was bad. He built a trail with much better construction technique and views than the Mist Trail, and his route would avoid the shower bath that you receive on the Mist Trail. His plan was to end his trail by blasting a ledge to the top of Vernal Falls on the north river bank, with convenient access to the falls, Emerald Pool, and the hotel. He did fantastically good work, but it took too long and the money ran out in 1882. His trail sat abandoned for a while, then in 1885 the park service took it over, and ran an extension down to the new Vernal Falls Bridge near the start of the Mist Trail. This allowed them to send horse traffic down via the old trail, much to the relief of all. But there is still a bit of Anderson's trail above the current route. As you climb up, just before you cross a boulder field and start down to the new bridge, you will see some stonework on your left. This is the next Anderson switchback going up. You can follow it for a while, until it just ends where his dream collapsed. 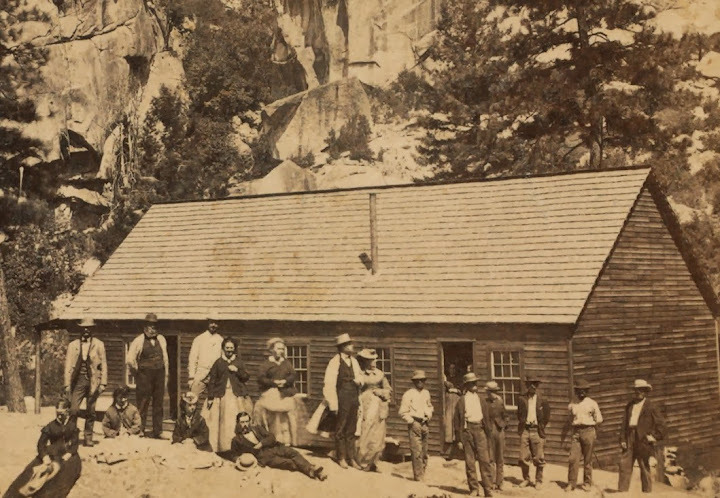 In 1870, Snow built a trail from Register Rock (where the current Mist Trail and Muir Trail split below Vernal Falls) with switchbacks up over Clark Point and back down to the river between Vernal Falls and Nevada Falls. That trail segment is still in use He then built a hotel on the north bank of the river, with a splendid view of Nevada Falls. Some of us remember the Hotel at Glacier Point, which burned down in 1969. But nobody alive today remembers Snow's Hotel, also known as La Casa Nevada, which burned in 1900. I would love to have stayed there. 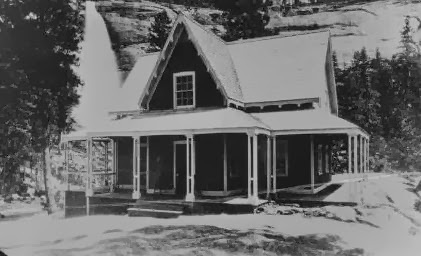 He opened half of the rectangular building in 1870 as shown above, the other half in 1871, and the chalet building in 1875, for a total of 22 bedrooms plus parlor, kitchen, etc., serving about 40 guests. You could just sit on the back porch and watch the falls, which you can see on the left in this photo. As you climb up from the valley today, you cross the bridge at the Silver Apron, then follow the Upper Mist Trail around to the right until you reach an open flat place at the foot of Liberty Cap where the hotel stood to your right. To your left is a grove of trees, through which a foot path passed between Liberty Cap and Mt. 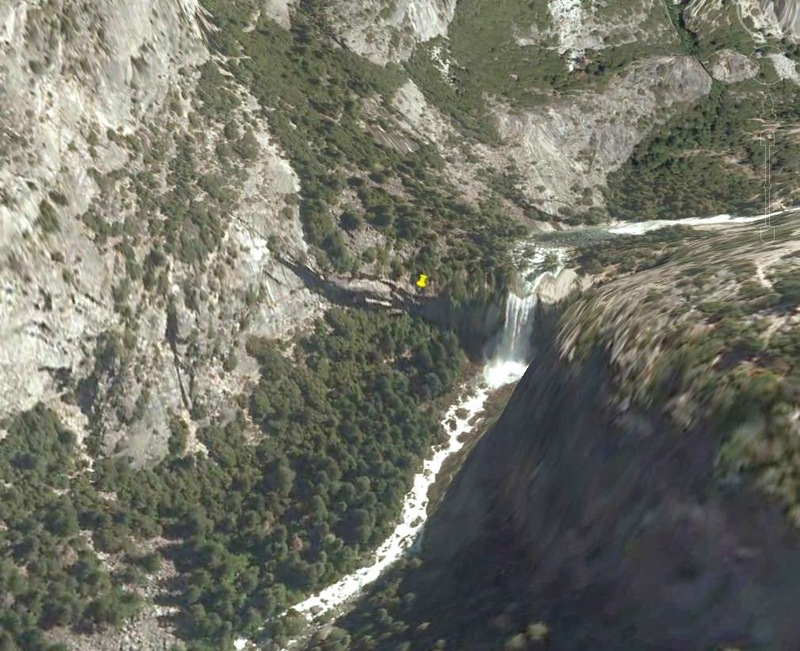 Broderick to Little Yosemite Valley (the current trail from there up to Nevada Falls had not yet been built). You can see that the old stonework is still is good shape, after 130 years of neglect. There are some bushes to deal with, of course. If you look closely, you can see the poor sods toiling up the lower Mist Trail. But that is a long way down. Chick-on didn't say exactly where he took this photo, but it looks like it was from the part of the trail above Vernal Falls. I had not mentioned it, but of course Anderson had run a spur of his trail down from Snow's Hotel. It stops just as the lower spur does, at the blank granite wall where he ran out of money and blasting powder. Chick-on sent this map, showing the two abandoned spurs of the trail. The red X shows where the present trail detours around the spot where the hotel used to stand. This upper part of the trail is still quite walkable, except for one spot next to the Emerald Pool that gets slippery in high water. At normal water levels, it is part of my preferred route up to the Diving Board. But that's another thread. Edited 1 time(s). Last edit at 02/28/2014 08:58AM by wherever. Thank you for the post. Very interesting. it is part of my preferred route up to the Diving Board. But that's another thread. Edited 1 time(s). Last edit at 02/27/2014 08:34PM by Bearproof. I don't think that I have posted it. I'm not happy with my current GPS trace of it. I'll try to get around to posting it this Spring. It's a preferred route, because I can get photographer friends up it. They love the Diving Board. Edited 2 time(s). Last edit at 03/01/2014 01:01AM by wherever. I have one if you want it. I went up from Emerald Pool to the slabs. 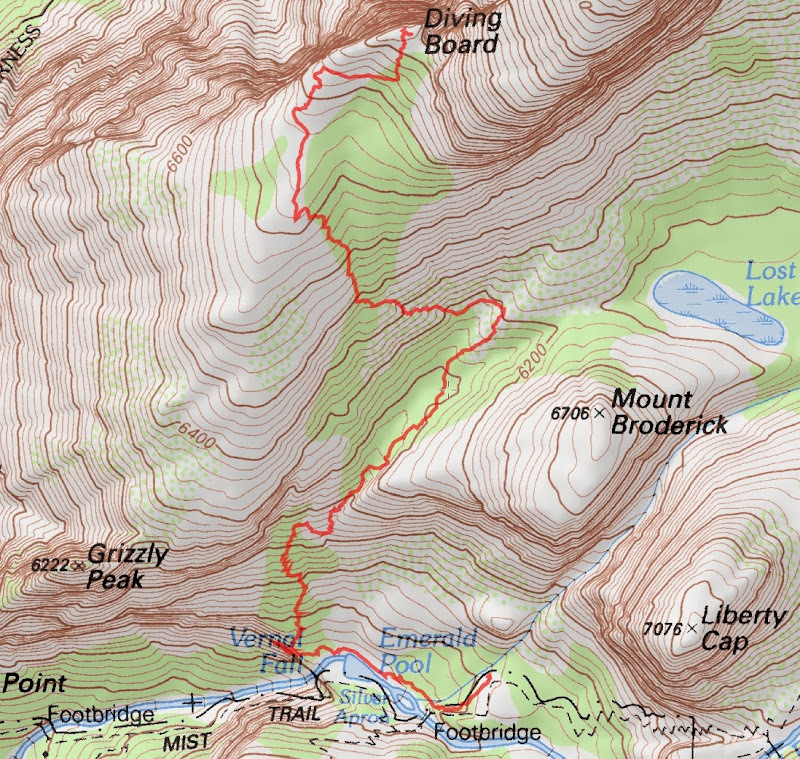 Down Shrub route... then up Broderick... and then down b/t Lib and Brod. If you've never done Lib/Brod... that is a must do. Up from Emerald is ... meh... just the quickest way. Honestly it's really pretty simple. I merged the up and down that just did for this map. NW is all cairned. 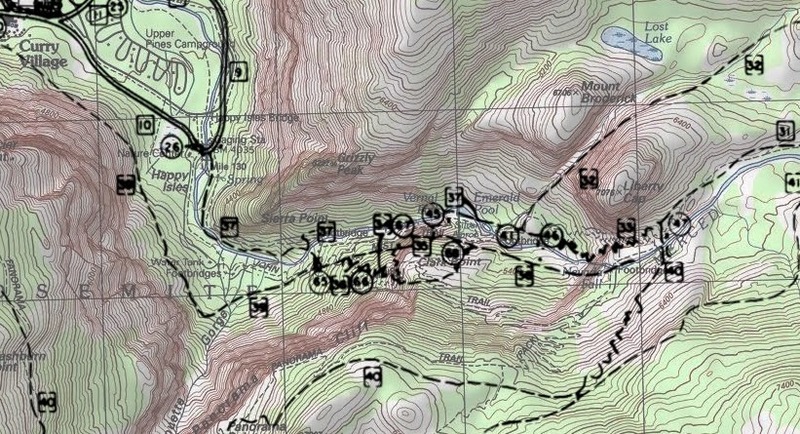 If you look closely at a topo map you can see why it goes that way. Wow! I had no idea that there used to be a hotel up there. Thanks for the informative post! I gathered some interesting information on Harold and Emily Snow from several sources over the years and one comment was that there was 11 feet of Snow below Nevada Falls on the warmest summer day; Emily was 5' tall and Harold 6' in height. Another made mention of Emily's New England wit - a young man requested more milk with his dinner and Emily stated, "Young man, it's time you were weaned!" Emily was also allegedly fond of passing a bowl of beans to her guests with the remark, "Here, have some 'strawberries!'" In the summer of 1969, the Sierra Club engaged in a massive cleanup of material left from La Casa Nevada ("the Snow House" . I believe that Harold and Emily wintered in the Groveland area and may be buried there. You can see that the old stonework is still is good shape, after 130 years of neglect. There are some bushes to deal with, of course. If you look closely, you can see the poor sods toiling up the lower Mist Trail. But that is a long way down. Chick-on didn't say exactly where he took this photo, but it looks like it was from the part of the trail above Vernal Falls. I had not mentioned it, but of course Anderson had run a spur of his trail down from Snow's Hotel. It stops just as the lower spur does, at the blank granite wall where he ran out of money and blasting powder. So the trail is running right along the edge of the cliff, which is what a good tourist trail should do. 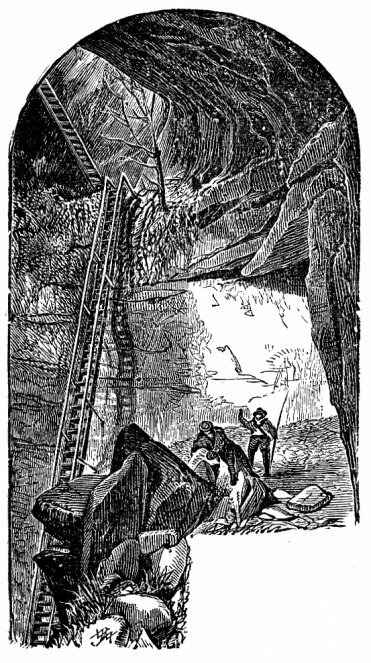 It's not clear whether Anderson planned to go around the end of the cliff, or blast a ramp, or build a (temporary) ladder. In any case, his creditors got to him first. By the way, Snow's original trail over Clark Point and down to the Silver Apron is quite visible in this photo. It remains part of the winter route to Little Yosemite Valley. X marks the location of his hotel. 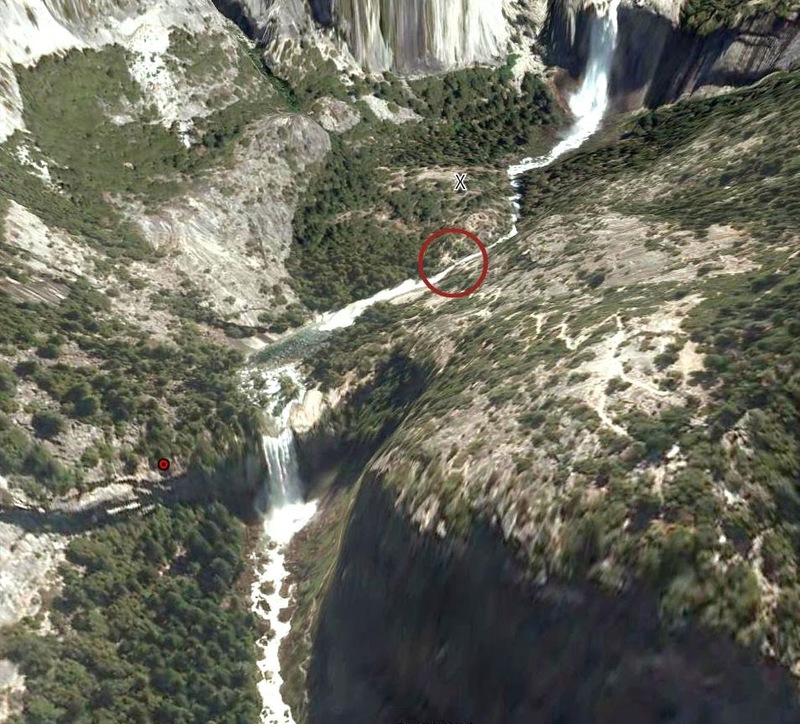 The present bridge over the Silver Apron on the upper Mist Trail is circled. Edited 2 time(s). Last edit at 03/01/2014 11:10AM by wherever. Thank you all for the excellent information in this thread. I love these historical topics. I'm going to be in the Valley this weekend, and I plan on taking some time to poke around these locations. This thread helps immensely to point me in the right direction. Edited 1 time(s). Last edit at 03/23/2014 08:07PM by ScottS. Two things I'm contemplating looking at that overlay map (thanks for posting it!) is 1) what trail is ? Never seen that one before, and 2) why isn't the trail to Sierra Point shown? In regards to Trail , did you see any former signs of it (like rock work or stone cuts) when you've been up that way? I have followed that route a number of times (though always entering from the base of Liberty Cap, not straight up the gully from the hotel), but have never seen any stonework. I think that it was just rough footpath, not a stock trail. More of a scramble than a trail. The overlay made by William and Mary Hood was meant to show historical aligments. You can expect it to be topologically correct, but not cartographically accurate. It's a pity that we don't have the actual map that it overlays, but Chick-on has done a good job of stretching the overlay to fit various candidate maps. 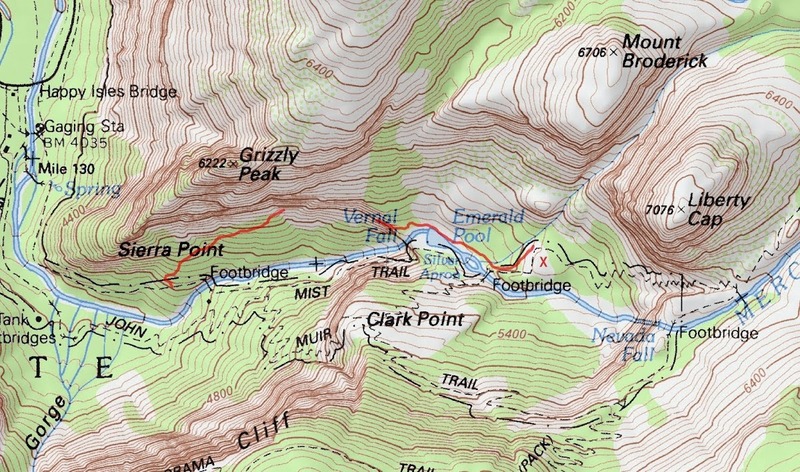 ...why isn't the trail to Sierra Point shown? Thanks for the update on the Liberty Cap Gully route. Looking at your photosynth of it, it would seem if there was ever a semblance of a trail with some rock work and such, it could have been very much obliviated over time due to the rockfall down that gully. but I really don't expect to find anything. You should do the same. This thread is quite old, yet I remember enjoying it when I first found it. 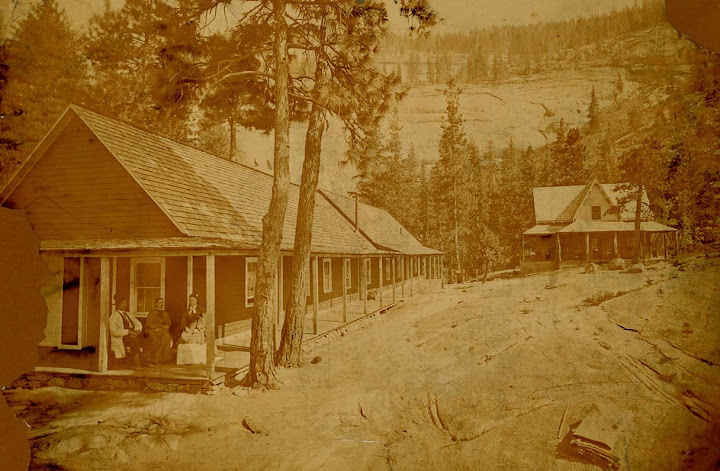 I was researching the geology of Slide Mountain (in NE corner of Yosemite) and stumbled upon a picture of Casa Nevada (Snow's Hotel) that I hadn't seen here and thought others might also like. It gives another perspective on the location relative to Broderick (and recent (at the time) rockfalls) . Edited 2 time(s). Last edit at 09/15/2016 09:35AM by ags. Many thanks for the post. 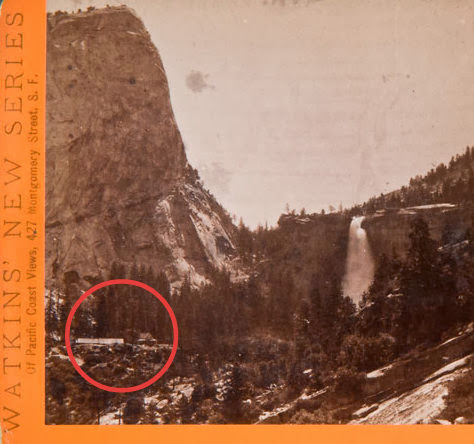 This might explain why there is so little trace of the old trail from Snow's Hotel to Little Yosemite Valley, before the Mist Trail was built. It ran between Liberty Cap and Mt. Broderick.